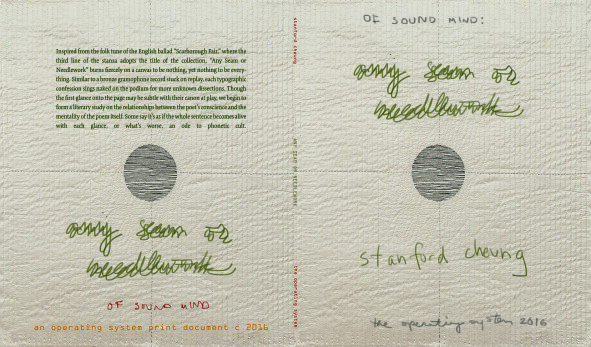 In 2016 The Operating System initiated the project of publishing print documents from musicians and composers, beginning with Everybody’s Automat and this year’s chapbook series, all of which fall under the OF SOUND MIND moniker, and all of which are written by creative practitioners who work in both poetry and music. I asked each of them a series of questions about the balance of these two disciplines in their practice, which I’ll share with you here. Please consider this template, approaching The OS’s key concerns of personal and professional practice/process analysis combined with questions of social and cultural responsibility, as an Open Source document — questions to ask yourselves or others about process and the role of poetry today. 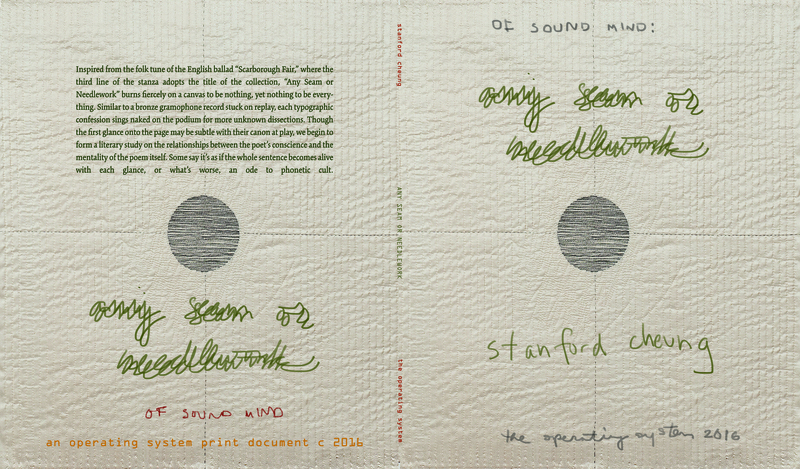 In this conversation, I talk to Stanford Cheung about his work and debut chapbook on The OS Press, Any Seam or Needlework. I’m Stanford Cheung. I am a concert pianist and poet from Toronto. Why are you a poet / why do you write? I write because poetry is the landscape that grows within language. Well, being a poet is like being an actor but with feelings dressed up your sleeves. To write is to be obsessed with the sermon of being obscene yet, there are no threads to perfection. Perhaps the satisfying gesture of never being able to writing proper phrases, yet make the reader feel complete, is what makes myself wonder why I write. When did you decide you were a poet? I was in an arts school where upon enrolling in creative writing class, I met a friend who was a spoken word artist. He’s also is an amazing trumpet player. Often times, he would call me out during lunch to recite some works he wrote. He one time gave me a book titled “The Life of the Poet” by Lawrence Lipking as a gift. Simply being immersed by his love for playing around with words and seeing the emotions swell up every time he performs is very touching. His love for animated films such as Studio Ghibli brought a sense of a second world to me. These days, I feel like I’m his introverted counterpart tapping into the world we both created in our early days. A poet is plunderphonics. Living in the surreal but grasping the environment by the neck to what exists. Then it’s translated to words and redefined universally. A poet is not just a stagnant identity itself, nor is it a made identity. Anyone can be a poet as long as one holds firm to expressing themselves. I feel there is no label. What is the role of the poet today? What do you see as your cultural and social role (in the poetry community and beyond)? The role of a poet today is simply to record experiences they once had in their life, transcend that experience into the emotional face of our society today, then paint it as a palpable prophecy in reflection to what is perceived at the table. Everyone has their own story to tell in the here and now. Society changes, and so does the hand we write with adapt to. Poems I write comes out of a tradition of expressionism; writing with perspective even if I can’t see what’s in front of me, but I try to see anyway. ‘Any Seam or Needlework consists of 15 pages and contains 15 unnamed poems. This collection was inspired from the traditional English ballad “Scarborough Fair” in which the third line of the second stanza adopts the title of my chapbook. My process of writing began with an artistic endeavor unlike any of my recent collections where my book took the form of an exact replication of my notebook. The act of freewriting and long strolls by the park played a large role in sewing these poems together. I also had the urge to adhere to my notebook’s indentations in order bring about the identical yet faithful depiction of my poetry. Much of the writing in a state of solitary. As the ballad suggests, it talks about a young man who instructs a person to tell her former wife to perform a series of impossible tasks and if she succeeds, he will take her back. Just like the plot of the story of this ballad, my poems use a blend of free verse and confessional elements to bring about the similar textures of the theme, as well as the teasing natures within the “Scarborough Fair”. Just as it is impossible to perform tasks such as making a shirt without a seam as stated in the ballad, the process of bringing the poet’s thoughts in unison with the poem can be, if not, just as impossible as the tasks stated in “Scarborough Fair”. My playing with the consciousness of the poem is the key feature of this collection. It often starts out with a rant of mine and like a seed sown beneath the soil, it will continue to grow and as it grows, I begin to manipulate the formation of words, the rhythm and musicality of the idea in which the play on of living words brings my naked poem into life. It’s almost like the phenomena of playing with fire. In short, my poetry studies the relationships between the poet’s ideas at work and its relationship with the mentality of their poem. Indeed, it was an extremely risky yet unique experience for me. Just like Phil Hall stated, hand written poems are like naked actors being themselves and typed out poems are like the actors on stage with suits. To be frank, after all what happened, I finished it in a week. It’s rather paradoxical. Did you envision this collection as a collection or understand your process as writing specifically around a theme while the poems themselves were being written? How or how not? Throughout writing this manuscript, I always had a sense of despair with each and every word written within the poems. The words though, each with a sense of independence, when mixed with other words, makes words feel extremely lonely. It was as if I could not find the correct words to pace my anguish and a car could pass through such isolation. In order to write these poems, I had to locate, gather, and preserve a kindle of my past. …as indicative of your method/creative practice? It is to test boundaries in language, the metonomy of language, and the space warped in language’s time. …as indicative of your history? I still feel the same. The collection remains a rational construct of emotion; confessing thoughts of certain individuals, places, and things in my work, and then turning them to metaphors of perspectives I see in life. The past was enjoyed. …as indicative/representative of your political or social beliefs? Like music being atonal, I don’t hold grudges. Simply naïve. Talk about the specific headspace of being a musician / composer / performer – when and how do you feel you enter a space of consciousness in which “sound” or “music” is the dominant sense? The headspace of being a pianist is to embrace an occupational hazard of performing on stage. The act of listening to oneself is also integral when playing for an audience. Different concert halls have different acoustics and different pianos. It is almost as if I am tinkering with a new instrument every time I perform. When one performs on stage, albeit the need to express intentions of a composer’s music is integral. I believe from the innate need to express, is where “sound” and “music” is juxtaposed into the dominant sense of a musician. I would say that during a performance, it is more of creating yourself an atmosphere where “sound” and “music” can become an experience within yourself, and you would react to the “sound” and “music” given in that down-to-earth moment. To perform is to be spontaneous. Do you feel that you are ever unaware of sound? (How) does your relationship to sound/music inform and/or affect and/or change other parts of your life / day / experience? Music is the most integral building block for liberation. Sound even if perieved unconsciously, will assert dominence on a person’s mind. I would say music is one of the oldest forms of artistic expression. From the sounds of birds by the window, to the rustle of leaves, all sounds are of a constructed nature. Likewise when we say that painting is the decoration of space, music/sound is the decoration of time. We are immersed in every second of our moment with sound. Music also has many variations carried with the understanding of sound. It is just as subjective as the natures of enjoyment itself. The organizations of sound can be vernacular, approached not through unconscious interpretations but instead, grown into ones system through experience. It can also be a statement of cultivated notions where one would need to approach these sounds with some form of effort. In return, they are blessed with edification (all credits go to Hitchcock). We can also say that the collection of sounds is ultimately preserved by humanity because firstly, it has a transcendental effect favored by composers for its lasting effects. Secondly, a collection of sounds favors accessibility. With the help of performers and musicians everywhere, anyone can access music easily. Finally, all forms of music is continiuous and championed by the creations of culture, and social landscapes. That being said, we cannot possibly be unaware of sound (thank you Crawford). Do you consider yourself equally musician/composer/poet? Are there other equally important disciplines, influences, labels or other words you’d want to call our attention to that we might not know that you feel are important in understanding your creative practice? If we didn’t get asked “what do you do” and force ourselves to fit into easily consumable disciplinary categories, what would you like your title to be, if anything? I will simply put that I am a musician and poet. Describe in more detail the relationship between music and language in your life and practice. How and when are these discrete influences / practices and how/when are they interconnected? How do they influence each other? Do they ever not? Music, and language can be interwoven down to two nodes. One is mental refinement, and the other is physical reflexes. Spending countless hours with the piano to find a personal touch to my tone, is the same to that of sketching figments on a notebook to find thoughts personal to myself. These practices are the very physical textures that engrave the acts of performing and writing itself. What is interesting is that, if the physical aspects of performing and writing are simply done through actions, they must have intentions in the first place. This is where mental refinement plays a role. As a concert pianist, to be confident is to know what one is going to do on stage. As a poet, to be conscious is knowing what thoughts are to be articulated. In short, much of my work is done before hand. Usually, I would spend time away from the piano to do some score studying and write out note by note, every measure of a on a piece of paper before actually playing the piece. Same goes to writing where I would have a mental imagery already formed (be it nebulous or not) and I place the pen onto the paper, where my physical act of writing, is trasmitted. In terms of your written or text based work, do you “hear” it, speak it out, hear its rhythms, before you write or as you write and/or before you perform? Do you ever memorize your texts / treat them more like a score or sheet music? While I was writing these poems, I did recall spending time in a cafe silently whispering the texts that I wrote. One thing I realized is that, every recitation is different from before. There is no way of replicating the same take on a poem. Just like performing, one will not be able to forge the same interpretation every time. I prefer to not memorize my texts. Instead, I like my poems to be improvisatory like how I often cut every line and stanza of my poems and rearrange them in a different order. It still remains a wonderful poem to me. That being said, poetry and publishing is the act of finding ourselves in the dispositionary world we thrive in. I believe that we publish because our prophetic voice wants to speak and that we want to be heard. This does not mean we are to preach our own ideals or force a certain part of our religious ideologies on one another. We are contemporaries of each other and in the end, we are simply reflections of each other. Stanford Cheung is a Canadian poet, writer, and pianist from Toronto. His performances have brought him to stages throughout the US, Canada, and Asia. His poems appear in The Nomadic Journal, Ex-Experimental Literature, Bluepepper Magazine and elsewhere. You can find him at cargocollective.com/stanfordcheung (poetry) and stanfordcheung.com (piano).